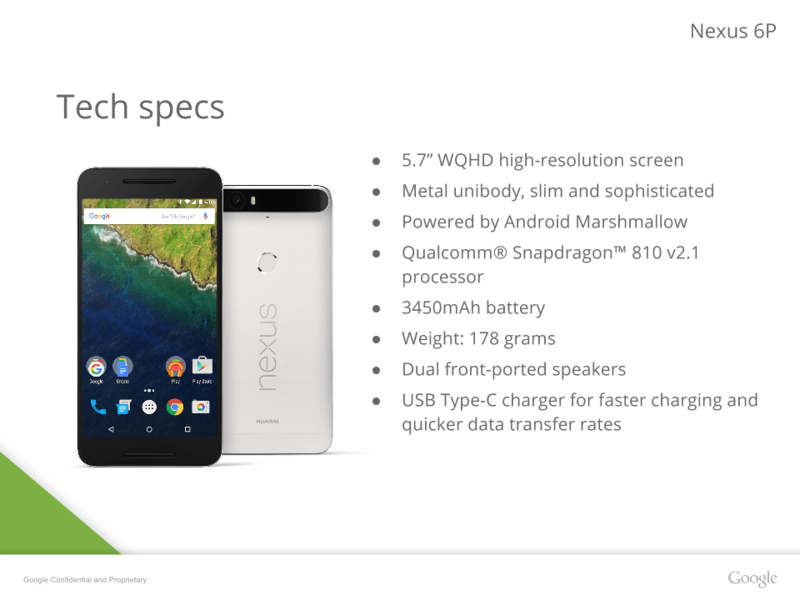 Leaked slides reveals the tech specifications of upcoming Nexus 6P that Google could announce on September 29. 5.7-inch WQHD high-resolution screen made up of Gorilla glass 4. The first all metal Nexus flagship. USB Type-C charger for faster charging and quicker data transfer rates. Fingerprint sensor at back side. Comes in 32GB, 64GB and 128GB. Colors : Aluminium, Graphite, Frost and Gold. 12.3 MP rear camera & 8MP front camera. Dimensions : 159.4 x 77.8 x 7.3mm. Nexus 6P will run on Android Marshmallow 6.0 out-of-the-box.